Whether it’s shipping a sofa or importing an iPad, international shipping has become infinitely more popular recently. Sometimes what you need to buy simply isn’t available in your home country forcing you to buy elsewhere. Perhaps you want to be the first of your friends to get your hands on the latest piece of gadgetry, or you want to compete in a foreign eBay auction. Whatever the reason for your delivery, international shipping can be a cause for concern among many people. The uncertainty of international dealers, the worries about damage during transport and the increased costs associated with cross country shipping are enough to discourage even the most seasoned shopper. If you’re unsure about international shipping costs or are concerned about the trustworthiness of some websites then you’ve come to the right place - we’ve compiled a checklist of what to look out for when you need international delivery. It seems simple to spot a dodgy dealer, but many scam sites can easily disguise themselves to look genuine, your first line of defence is a good firewall or antivirus software – these should curtail any unsolicited access to your data. Secondly on payment pages it is vital that the site shows https:// the S stands for secure – you can also look for a key or padlock on the page or in the address bar. Also, keep an eye out for secure payment certification, such as Verisign, Sagepay or Paypal. Sometimes the easiest way to tell if a site is secure is to simply search the web, on your preferred search engine just try “site name scam” or “site name trustworthy” to see what others think of it. In the end, it’s down to you but we suggest you err on the side of caution. Buying within the EU is usually your safest bet, members of the European Union are obliged to repair goods that are under warranty so if something does go wrong you can take some solace in that. You might have to pay for it to be transported back the manufacturer, however. Make sure you check that the country you’re buying from isn’t just importing it from elsewhere, hidden costs and charges can quickly mount up when buying internationally. Foreign electronics can also be delivered defaulted to their home language or be packaged with unusable chargers for example. eBay (and other auction sites) have opened up a wealth of previously inaccessible goods to the world, purchasing goods from abroad is made a great deal easier through these means but the ease of buying and selling goods internationally can lead to some shady practices. Whether buying from an eBay store or an individual there a few things that you should check to make sure that they check out before your checkout. - Feedback: What was it for, when did they get it? - Disputes: Has the seller been in any, what for? - Photos: Be sure that there is at least one original photo of the auction, we’d strongly advise that you don’t quote on anything without a picture – regardless how tempting the price may be. As you might expect, there are few things that can hold up delivery when buying from abroad, but fear not, these are to be expected and whilst it can be stressful if your items end up being delayed sometimes it’s unavoidable. - Clearing customs: Anything delivered internationally must pass through customs and excise, foodstuffs and pets brought in from abroad can be particularly susceptible to import delays due to contamination concerns. - Unforeseen events: The weather, political action, impassable roads, or overzealous volcanoes can all potentially slow international shipping. The further your goods need to travel, the more things there are to hold it up – so keep an eye and ear out for anything that could delay your delivery. If you have the opportunity to choose your own delivery method, or you’re sending something abroad yourself then it’s important to pick the right international delivery service. There are couple, of different choices and things to look out for when looking for a cross country courier. Large Courier Companies: Big parcel delivery services run large logistical chains and benefit from large economies of scale. However, their customer service and reliability are often drawn into question. Their price can be competitive, but you’ll usually get a less personable service. 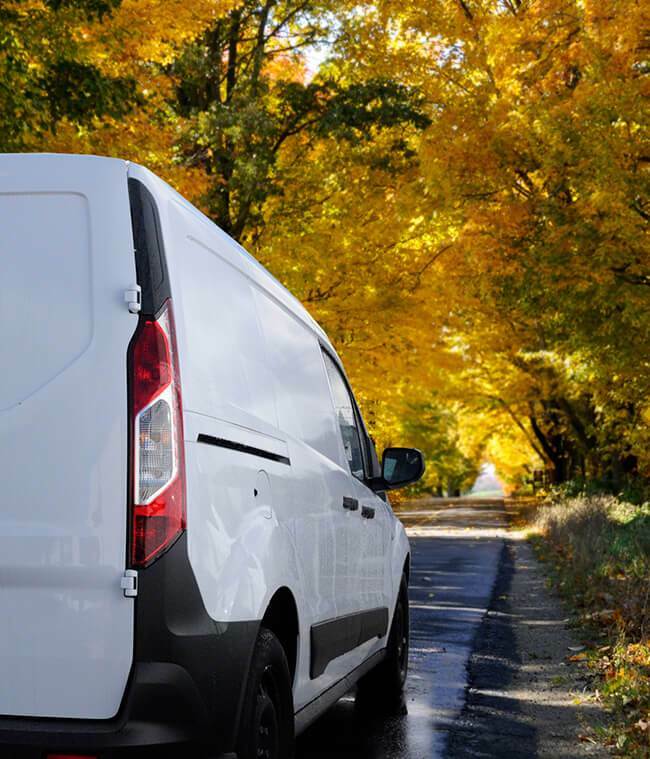 Smaller International Couriers: Whilst this might seem like a slight misnomer, you can get an independent man and van services that conduct deliveries across Europe. These smaller businesses rely heavily on keeping their vehicles full, so if you can organise a transporter who is coming to the UK from your country of purchase then you could help them fill space and get a better rate. Shipping: If you’re bringing in goods from further afield then shipping might be your only option (we discourage air-mail because it’s highly carbon intensive!). Now you usually don’t have much power over how smaller packages are shipped internationally, it will usually be put inside a container for ease of transport along with lots of other consignments. This method can take a while but is a very safe way to import goods. Finding and comparing all manner of delivery services can be a laborious task, getting the best quote for international shipping can take a lot of work, all the factors in play can mean that prices among couriers can vary greatly. This is where Shiply can assist you! If you need to import French furniture or deliver Dutch documents then we can match your requirements to transport companies already making a similar journey. Simply upload the details of your shipment to our site, we need to know what you’re moving, when it needs moving and where it’s going. Once this is online any courier who is planning a journey along that route will be able to quote you an estimate for the job. Transport providers will compete to offer you the best price in a reverse auction format, you can then compare the quoting companies based on their price and feedback from other users on Shiply. Once your items arrive from abroad be sure to check that they are as they were pictured or described when you purchased them. Also make sure that no damage has been caused during transit, a dented box might be expected but if anything’s broken then you need to contact the seller and delivery service as soon as possible. When you’re happy with your delivery please leave feedback for your transporter if you found them on Shiply – the feedback system helps all of our users spot the best delivery companies and helps the companies themselves improve their service. Complete one simple form and quotes come to you via email. Hassle-free, no phone calls required. All delivery companies on Shiply are feedback rated for your peace of mind. As Shiply's delivery companies are already making similar trips, quotes are up to 75% cheaper than standard rates. Need assistance? Email or call us. We are here to help. Request quotes from our 102,334 rated transport providers. Compare prices and read previous customer feedback to pick the right delivery quote for you. Sit back and relax while your item is safely delivered by your chosen transport provider. By utilising spare capacity of vehicles running on the road, Shiply helps reduce the number of otherwise wasteful journeys needed to transport the item. "Simple and effective, will be using regularly. Good value and makes the process of moving big things around so much easier!" "In a matter of hours, I received an offer that matched my budget from a company with very good feedback. I love being able to rely on Shiply for getting the precious finds from eBay across the country for a reasonable price." "Shiply fills the gaps between getting bulky items collected and delivered and you having to go get them yourself. Used them many times, saves me lots of time and money." "All went very smoothly and easily and the courier whose bid I accepted were lovely, good communication, and helpful. Couldn't fault at all and would certainly use again." Are you a transport company?